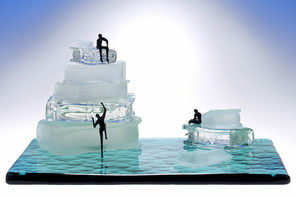 Cesare Toffolo was born in Murano in 1961, and grew up in a family of top Glass Artists. His Grandfather Giacomo, was a Master Glass Blower in the Venini Furnace. He tau ght his son Florino (Cesare’s father) the techniques that made him also a Master Glass Blower at Venini by the age of 17. 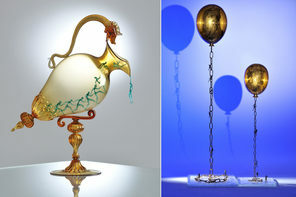 Florino then specialized in flameworking blown glass, getting the acceptance of the most traditional people of Murano. Cesare often visited his father’s studio, and learned lampworking at 14. He lost his father three years later, but continued perfecting the technique on his own. He reached the same credibility that Florino enjoyed in Murano. 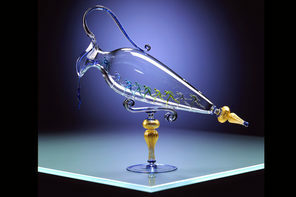 In addition, Cesare developed many flameworking techniques with the borosilicate glass never tried before. 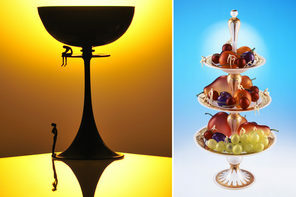 Some of these are the Filigree and the use of Gold leaf. 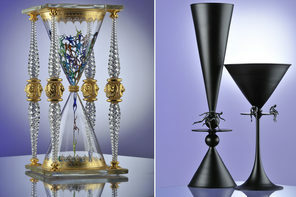 He collaborated with the most prestigious glass establishments in Murano and with international famous designers. He was 21 when he exhibited at the Palazzo Ca’ Vendramin Calergi in Venice. At the age of 30, in 1991, Cesare was invited to teach at the Pilchuck Glass School in Seattle. This was followed by other courses there, and at the Niijima Glass Art Center in Tokyo, at The Studio of Corning Museum of Glass, at the Penland School of Crafts in North Carolina, at the Toyama Glass Art Institute, at Kanazu Forest of Creation Foundation in Japan. He’s been invited to demonstrate his lampworking skills in Tokyo at the Glass Art Institute and at the Glass House Institute, at CERFAV in France at the Symposium European of Glass, and in various GAS Conference. Cesare is one of the top Glass Artists in Murano, and his work is listed in publications that track down the value of high End Art in Italy. He was the conceiver and the founder of CENTRO STUDIO VETRO, a non-profit cultural association in Murano born in 1997 that promoted Glass Art in Italy and Abroad. He was also the conceiver of the Glass Magazine Vetro published by C.S.V. From 2001 to 2003 he coordinated as Artistic Director the first Glass Workshops in the Venice lagoon, exactly in S. Servolo Island. In 2018 Cesare joined the Glass Art Society Board and coordinated, as Chairman of the Muranese Committee, the event GAS Conference 2018 in Murano. 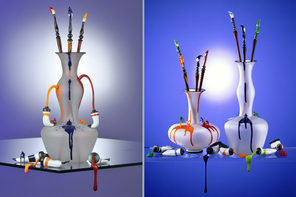 In the same year he published two Volumes, the title is: Il Vetro a Lume - Lampworking. His Studio and Gallery are located in the famous Murano street “fondamenta dei Vetrai”, in an old palace of 14th Century where he creates his glass with mastery and artistic inventiveness and, for many years, his glass art work is exhibited in museums, galleries and private collections worldwide.